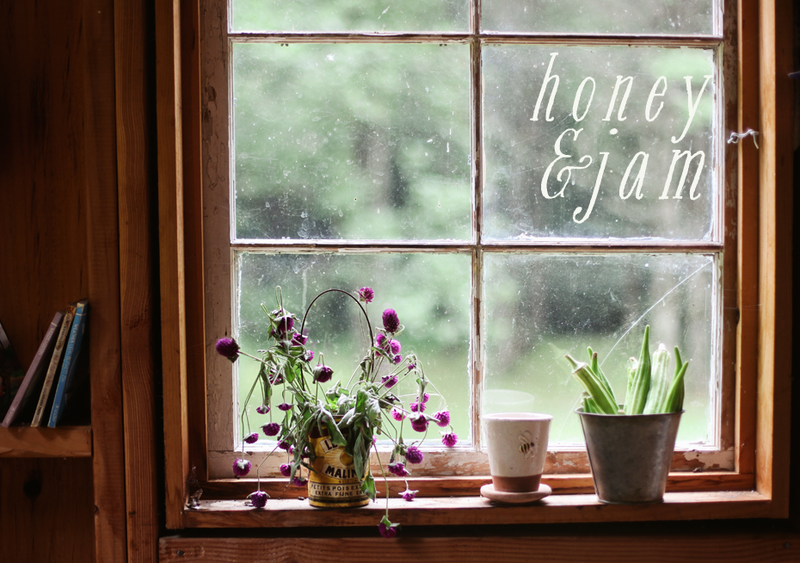 honey & jam | recipes + photos: Is it fall yet? Apple Crisp. Is it fall yet? Apple Crisp. I wore a sweater today. I realize it was a bit premature, as it’s still 80 degrees outside, but my crazy longing for fall made me do it. You see, I really, really love fall. I love the cool, crisp air. The bright orange, red and yellow leaves. The smell of bon fires in folks backyards. So towards the end of August I always go a little crazy. Wearing scarves, sweaters, the occasional pair of boots. My bout of crazy was only furthered by finding the first apples of the season at the farmers market yesterday. As soon as I tried one, I was smitten, they were delicious. I had to have some. Apple crisp might be my favorite dessert ever. It contains all of my favorite things: apples, cinnamon, oats, brown sugar and butter. And this one might be the best I’ve ever had. (but that could be the crazy talking.) I used a mix of gala and jonathan in this and it came out perfectly. It’s a little bit of fall in every bite. Preheat the oven to 350. Generously grease an 8×8 baking pan with butter. Place a layer of apple slices in the bottom of the pan and dust with sugar/cinnamon mixture. Continue layering apples and dusting with cinnamon/sugar until done. The apples should be just about to the top of the pan (they will cook down). For the topping, place the flour, brown sugar, cinnamon and oats in a large bowl and stir well with a wooden spoon. Work the butter into the mixture with your fingertips until evenly distributed. It will be sort of dough-like. Spread the topping evenly over the apples. Bake the crisp in the dish on a baking sheet on the center oven rack until the topping is crunchy and the apples are bubbling, 55-60 minutes. Hannah, your photography is gorgeous! it puts mine to shame! Brava! Once again, stunning photos! I love apple crisp. My favorite "cooking" apples for pies is a mix of Honeycrisp, Fuji, and Granny Smith. Gorgeous, delicious, heavenly. Wish I could smell it, too. I love fall too! It's unfortunate that I live in a state that doesn't seem to do "fall" very well...it'll be 90 degrees until mid-September, we'll get a few weeks of up and down weather (85 degrees one day, 55 the next), and then all of a sudden it'll be cold. Not really cold, I mean, Texas cold, but there's no long, drawn out state of "cool". Love it just the same though. Okay - I was TRYing not to wish away the rest of the summer but if this recipe didn't do it, then that picture of the apple did! (wow, I love it!) Can't wait to make this with our first bag of apples. i have the same kind of fall crazy too...i can't help it! i put on my new boots the other day, just wishing it weren't a cool 100 outside. your photos are delicious hannah! I wore a sweater today too...and it is way more than 80 here! I long for fall. The Apple Crisp looks delicious!! I am so ready for fall! I love wearing jeans and being able to layer and the crisp, sunny air. 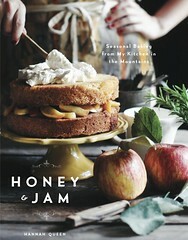 Gorgeous photos, I especially love the one of all the apples and the close up of the spoon. YUM! I was so excited to see your post! I am the same way - I start wearing my jeans and sweaters in August because I can't bear to wait for fall to arrive. 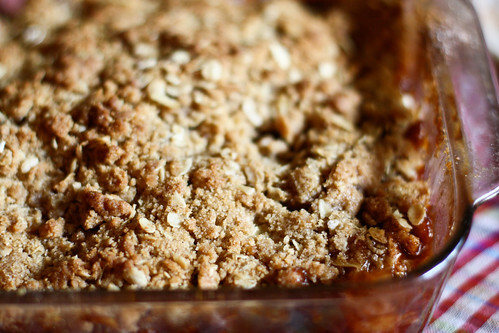 I think I might have to make some of this apple crisp to start the festivities! Hannah, You would have loved Chicago today, all drizzly and dark, enough that I had to pull on my jacket when I went with my coworker to get lunch. Fall is coming! I feel it here! 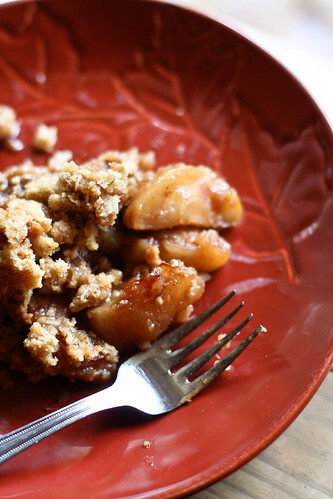 Gorgeous photos and an apple crisp is always welcome. We don't have fall season but I just love them. Thanks for the recipe. FALL IS MY FAVORITE!!! Your photos...*jaw dropping open & eyes popping out* teehee!!! YOU GO GIRL!! This recipe does sound great, agreed, but the directions are a little...twonky. First it says to layer apples with sugar+cinnamon, then it says to mix them all together? Then, it says something about mixing the topping and the word 'nuts' is in there but no nuts are in the ingredients list. Caitlin, thanks for pointing that out. I'm going to edit them and see if I can't make it more clear! I loooove fall. My husband thinks I'm crazy! I think every women secretly loves fall just as much as me though. Scarves, boots, trench coats, peacoats, scarves...the colour, the smoky air, you nailed it right there. I am totally on the same page as you! 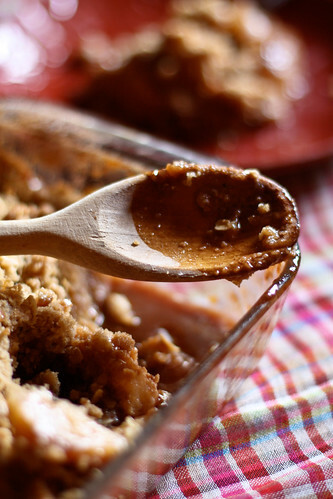 Love autumn, love sweater weather, love the crispness in the air, love apples, love apple crisp... The crisp looks amazing and something about the light in your photos makes it look like I could dig right in. I absolutely adore Fall as well...and since I just picked up a big bag of apples, this is going on my to-bake list for the weekend! I second your sentiments exactly. yes! fall, please hurry. I am burning up over here in southern california so the thought of making a crisp sounds miserable...as AMAZING as this looks. Can't wait til it cools down so i can try! I could wish for Fall all I want but we have only one season here in FL and that's HOT and sometimes warm! After that banana crisp I made not too long ago I'm ready to try other crisps and yours is lookin' mighty fine! I have had some peaches in the fridge for a while now and have been looking for a good crisp recipe-- I think this is it, even though yours features apples! Thanks!! The top apple photo is magnificent. Truly! OMG! This looks super yumm! Now, I am going to go to sleep with a burden on my shoulders- I have to make this Apple Crisp right away! That crisp looks so delicious! I love that kind of treat! All I can say is Yummmmmm!!!! I have the opposite situation. It's cold and wet and feels like fall's been around forever. 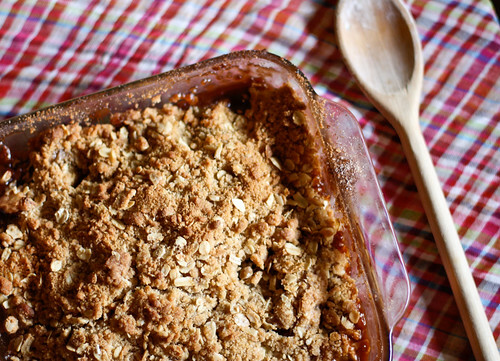 But although I'm NOT ready for fall, apple-recipes is reason #1 to embrace the season. My favourite is apple crumble - or pie. I waited so long for summer. To bake with berries and peaches and cherries. But I slacked off and didn't take advantage of any seasonal fruits (with an exception of the occasional boring strawberry). Hopefully I'll kick it into high gear and go crazy with my favorite season, Autumn! Mmmm apples, pumpkins, sweet potatoes, spices... yummmmm :D Thanks for getting my ming going! I love crisps more than anything in this world. Yes! It's fall and it's ok to gorge on apples. Yay! Nothing says "hello fall" more than this beautiful crisp! 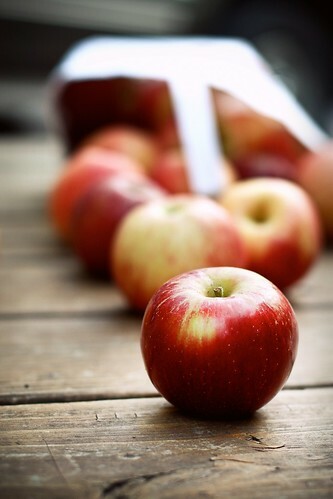 I would dive right in if I could, apples are divine in anything sweet or savory. yumm! love your blog so much. I just made a crips this week also. It so good, can't stop eating it. Yours turn out beautiful. I made this the other night and it was delicious!!! We couldn't help ourselves and even had some for breakfast the following morning. Thanks for posting it! Definitely making this tomorrow. Looks fantastic!! Thanks for the recipe; I'm curious about the dusting of the spice/sugar on the apples instead of mixing it altogether - do you find it makes a difference? Laura: I'm glad you liked it!! Letitia: I sort of dusted and mixed. I don't think it really matters either way!